I think I did this right.. The primary question is the battery config? It is all working as expected however I just want to make sure that the battery connections are correct for the panel and the inverter. placement of positive and negative cables. Just curious, i assume your 50 amp panel has two different hot legs, does your inverter power both legs or just one leg? On my 30 amp setup i have two seperate sides on my ac panel, and one side is only powered by shore/gen, and the otherside is either shore/gen or inverter based transfer switch. This way i put the dc converter and my ac unit on the side that only works on shore/gen so i wont have to worry about the inverter trying to run the ac or batter charger. The inverter powers the generator side of the transfer switch and then jumpers to the other side to provide power to both sides of the panel. Looks good in my opinion. My only caveat is to make sure you dont have your dc converter running while on inverter. Im still not sure i got an actual answer. specifically, if I have four batteries, do i connect the positive from the first one and the negative from the last one to the inverter.. or do i connect the positive and negative from the first OR last one to the inverter? I'm not sure I understand what you are doing. I think you are planing to have one shore power cord that is plugged into either a pedestal or generator. Correct? It might be helpful if you labeled the wires/colors. 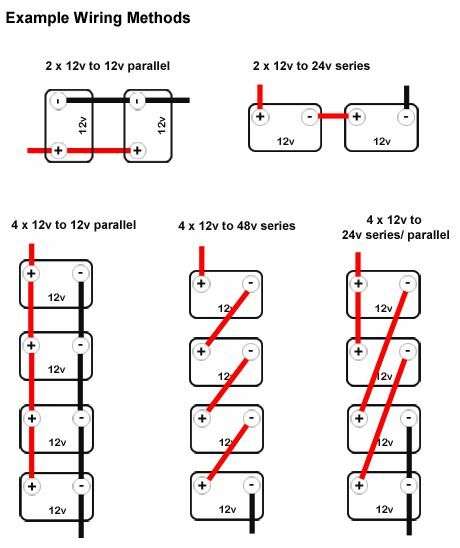 It appears that you have both legs (hot - of the 50 amp circuit) going to a single panel? Correct? Is this a split panel where half of the breakers are powered from one leg and the other half from the second leg? I'm not sure I understand what you are doing. I think you are planing to have one shore power cord that is plugged into either a pedestal or generator. Correct? It might be helpful if you labeled the wires/colors. It appears that you have both legs (hot - of the 50 amp circuit) going to a single panel? Correct? Is this a split panel where half of the breakers are powered from one leg and the other half from the second leg? That is correct. It is a 50A Progressive Dynamics panel which has a two pole 50A breaker in the middle that powers both halves of the panel. Then there is a a 12v panel on the right side for all of the 12v stuff. And a charge conrtoller in the bottom. Battery wiring depends battery voltage, battery count, and desired output. I assume you want a 12V bank, as that is typical. Also assume you are using 12V batteries. There's been some posts lately about balancing battery size with inverter size. I'm pretty much a moron when it comes to electrical (I just want to know what's tried-and-true for other people and copy their system!) but something about internal resistance inside a battery and it not being workable with too big of an inverter.